The first phone to feature Android 6.0 Marshmallow, the Nexus 6P boasts fingerprint security, a 5.7-inch WQHD AMOLED display and a 12.3 megapixel low-light camera. 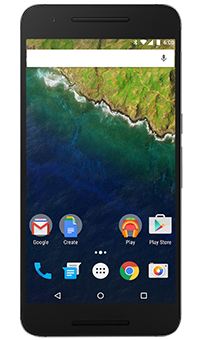 Be the first to experience the brand new Android 6.0 Marshmallow with the Nexus 6P. New features include fingerprint sensor support, improved battery performance and Google Now on Tap - a new way to explore and get information. With a fingerprint sensor located on the back of your Nexus 6P, you can turn it on and unlock compatible apps in a flash. Access is fast, simple and more secure - and right at your fingertips. The Nexus 6P has a contoured body crafted from aeronautic-grade anodised aluminium, making it tough, light and comfortable to hold. Housing the latest octa-core Qualcomm Snapdragon 810 processor and a 3450 mAh battery, the Nexus 6P gives you blistering speed and a long battery life - ideal for streaming movies, music and more throughout the day. crystal-clear images, even in low light. Coupled with the faster Google Camera app and the Google Photos app, you'll never miss a moment that matters.